I was given a copy of the ARC by the author Chris Mooney. Thank you so much Chris!! you are the best! I discovered Chris Mooney when I picked up his novel Deviant Ways. I instantly fell for Jack Casey and the mysterious Malcolm Fletcher. 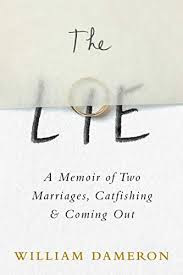 I have read all of Mooney's books and I have adored all of them. 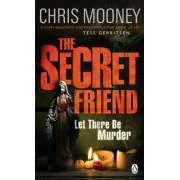 The Secret Friend is the newest Mooney entry and I have to say that I ADORED this book. Our main character Darby McCormick, who we have seen in Mooney's previous novel is back and she is asked to investigate a body that was found floating in the Boston harbor. After some research, the body is linked to another murder - that of Emma Hale - who has a father with an endless supply of money and many, many connections. As Darby continues to investigate, she will come across a potential third victim which will lead the police on a wild chase to find the third victim before she is killed. Surprisingly, Darby will get some unwanted help from a very, very important person - who makes a return appearance from Deviant Ways - and I am so thrilled that he is part of the storyline. Mooney made a great move in joining Darby and this character and we now get a tad more info on this character. There is chemistry between the two and from the very beginning, when they meet, you can feel a connection, although Darby refuses to acknowledge it. What I also loved about this book is the location. Alot of the action takes place in a deserted, spooky mental hospital. Mooney does a great job of describing the hospital and makes it all sound almost supernatural. I thought it really added to the storyline. There is also an interesting twist towards the middle of the book that I was not expecting at all. All I can say is that I am thrilled to see these two characters in the same book and I think it may be time to bring back someone else from Deviant Ways - please Chris??????? You have to buy this book - its a great read and will make the hair at the back of your neck stand up. Oh, this sounds excellent. I'll have to keep an eye out for it. Thanks for the review! This sounds like a great one! This is a new author for me, but I will have to check him out! Thanks! You won Home Girl by Judith Matloff! Congratulations! Please email me your shipping address at mawshimp at gmail dot com. Thanks! This does sound good. Will it matter that I haven't read any of the other books? Will put this on my wishlist - thanks! !